Aprilaire Whole-House Humidifiers were introduced in 1954 as the first evaporative, flow-through design humidifiers. 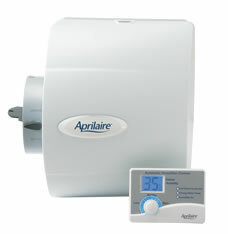 Aprilaire humidifiers introduce the right and healthy amount of moisture into your air, never too much or too little. Aprilaire humidifiers can help symptoms with dry sinuses, itchy skin, static shocks, dry, cracked damaged wood floors and furniture and help ease allergy and asthma symptoms.